Do you have Google Analytics installed? Or do you maybe use the built-in statistics section of your blog host? I do both - but only very occasionally, when I remember! What I find most interesting when I do get round to checking are (a) the most popular posts of the last week or month, and (b) the top search terms that have led people to my blog. I went to Google myself and typed in 'roast dinner' to see what happened. I scrolled through 5 pages of results without finding my blog, so it seemed unlikely that such a large number of people would have found me that way. Then it occurred to me to try the images tab. Sure enough, there I was! But - why?! Are lots of people suddenly in need of pictures of a roast dinner, and finding mine particularly appealing? Or is one indecisive person in need of a picture of a roast dinner, and visiting over and over again while choosing whether to use mine? And can I find out if my picture is being used anywhere? And do I mind if it is? Meanwhile, I'm very happy to see that another top search term on Google that leads to my blog is 'malteser' :) But others include '"king edwards" potatoes disaster', '"mobile phone contracts" + mummy', '"my glasses" or "my new glasses" site:blogspot.com', '"odd sock parade"', 'bus 128 sketch', 'photographing stockings' and 'the cat and owl and dog'. Sometimes the internet can be very random indeed. Don't worry; leave it to me. I will go through life henceforth ever-vigilant for your picture of the roast dinner. Roast dinner picture stealers never evade my eagle eye for very long. It may be years, decades even, but they will be brought to justice. Mise, you have set my mind at rest. Thank you so much! 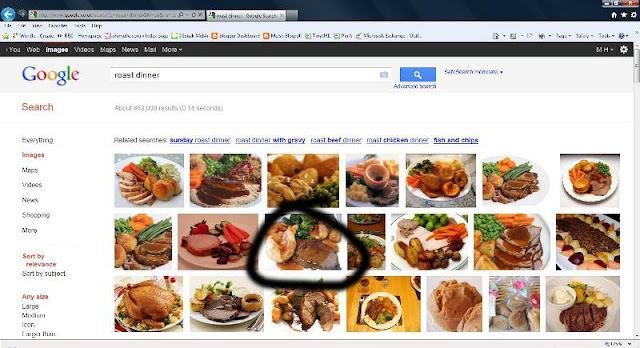 I can relax again knowing that no photograph of a roast dinner will go unscrutinised, and no roast dinner picture stealer will go unpunished. Ha ha, Mise! Well, Mel has nothing to worry about now. I am sure I set up my Google Analytics, when doing the BBFS course with Shimelle, but I don't seem to have used it much and when I try to use other tools that utilise Google Analytics, they don't seem to pick stuff up. Perhaps I didn't do it right. Roast Dinners, new glasses, photographing stockings... Randomness indeed! mmm this has reminded me I set up google analytics but have not looked at it! As for what people search for - very strange indeed. At least you can now rest easy, with a roast diner detective on your side! I've never heard of Google Analytics, so some of this is lost on me. i did, however, read an article about how the search engines have built in filters, which monitor which sites you visit and direct you towards those that they think you are going to 'like' most. Best way to try this is to type the same search words into Google into your computer and then compare the results with someone who would normally visit very different sites. Oh dear, I need to 'fess up, I am the kind of person that googles images of weird and random things, but it's part of my job honest! I help produce our school newsletter and it is quite a work of art (for 'work of art' read 'ridiculous amount of time and energy spent on it'!) Every article - and we have 21 pages of them - has to have an accompanying image. So if there isn't a photo from a school trip or whatever - I have to find something appropriate from Google. And that included an item on the price of dinner tickets going up! Not that your roast dinner looks anything like the delights that our school canteen dishes up (if only!) I shall keep an eye out for Melsh pictures from now on. I get lots of hits from folk looking for pictures of Sindy - that goes back to my story about the Sindy book. Oh, and lots from "person drawing". It's definitely fun to check this out, you are right! Oh very random! LOL! I've seen people finding my blog through the strangest of search keywords. I've used Google Analytics but it always leaves me scratching my head in confusion so I use Statcounter as I find it a bit simpler! I've been wanting to do a post like this too, so watch my blog because you've inspired me to do it sooner rather than later! I have some of the silliest things that people have searched for, but my top one is "yarn wrapped." Random! Totally random! I have Analytics set up, but don't think I have ever looked up those kind of facts. I took part in Shimelle's 10 on the 10th last week and was interested to discover that it was my least visited post of that week. I would have expected it to be the most, so you never can tell! I have Analytics installed, but like Kim , much prefer to use Statcounter .. when I remember that is! I am quite relieved Mise is volunteering her time to vigilently scrutinise all Roast Dinner images, however, it does, once again, bring up issues of watermarking photos and privacy. you want really random? apparently one of the top searches to find me is Diet Pepsi. But the thing is, I have never ever even mentioned Diet Pepsi on my blog. I can't stand diet beverages & never talk about them. I just checked my site stats and various searches which include the words sikh wedding seem top of my list. All from one photo posted on 10th September!